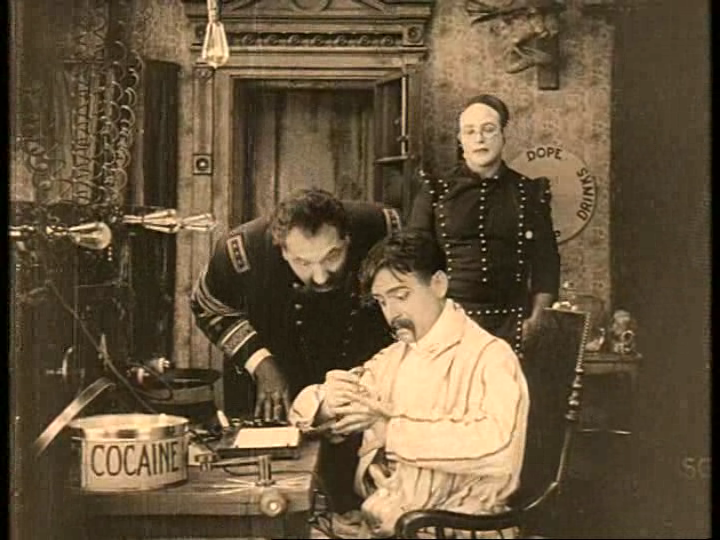 Buster in 'Sherlock Jr.' (1924), showing tonight at the Rogers Center in North Andover, Mass. 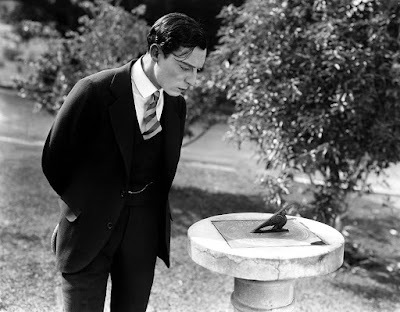 Alas, I'm not attending this year's Buster Keaton Celebration in Iola, Kansas, which takes place this weekend. But I'm doing the next best thing: accompanying a pair of upcoming Keaton programs in my corner of the world. First up is tonight's season-opener at the Rogers Center for the Arts on the campus of Merrimack College in North Andover, Mass. 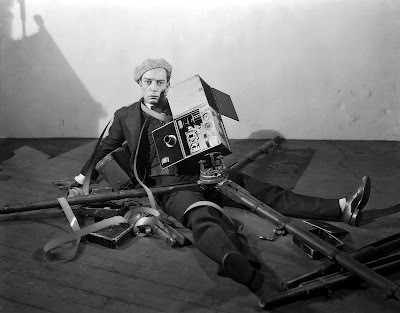 The program features 'Sherlock Jr.' (1924) and 'Our Hospitality' (1923), two of Buster's best silents that I think show his remarkable abilities even early in his film career, when these pictures date from. For more info on this show, and the rest of the season at the Rogers Center, check out the press release below. And then on Sunday, Sept. 27, I'm accompanying Keaton's last silent feature, the MGM-produced "Spite Marriage" (1929) at the Wilton (N.H.) Town Hall Theatre in Wilton, N.H. Showtime is 4:30 p.m. Both programs are free and open to the public, although a suggested donation of $5 per person is requested for the Wilton show to help defray expenses. Buster's silent features still work as well as ever, and remain audience favorites today. But even just a little historical perspective makes them all the more interesting and amazing, I think. What I'm thinking about is how I recall someone once described the difference among silent film's "Big Three" of comedy. Charlie Chaplin's art was essentially rooted in the past—a kind of Victorian sensibility found in the theatrical melodramas of the 19th century. Audiences responded to the timeless and familiar qualities of this kind of story-telling. Harold Lloyd played a character very much of the present, meaning the Roaring '20s. Audiences responded to him because his adventures were part of the shared experience of contemporary living. And Keaton? Well, we're still trying to catch up to Buster: his outlook, his attitude, and everything else. In that sense, I think an important aspect of Buster's work is how he used the film medium. Watch enough silent films of all types, and you realize how advanced Keaton was for his time. Remember, it was an era when filmmakers were just beginning to develop the basic grammar of cinema: long shots vs. close-ups, transitions, camera positions, and so much else. Apparently on instinct alone, Buster knew how to position a camera and frame a shot and edit a sequence for maximum impact. Timeless appeal: Buster and a sundial in 'Seven Chances' (1925). So his films are full of techniques that later became common in motion pictures. But that's something not immediately apparent to modern audiences, who've been marinated in visual story-telling and entertainment our whole lives. 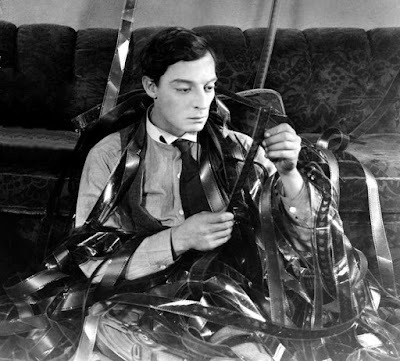 To us, Buster's films look like: well, what films are supposed to look like. But check your calendar: we live in 2015, and Buster was working 90 years ago. Okay, here's info about tonight's screening and the rest of the 2015-16 season of silent film with live music at the Rogers Center in North Andover, Mass. Hope to see you there! 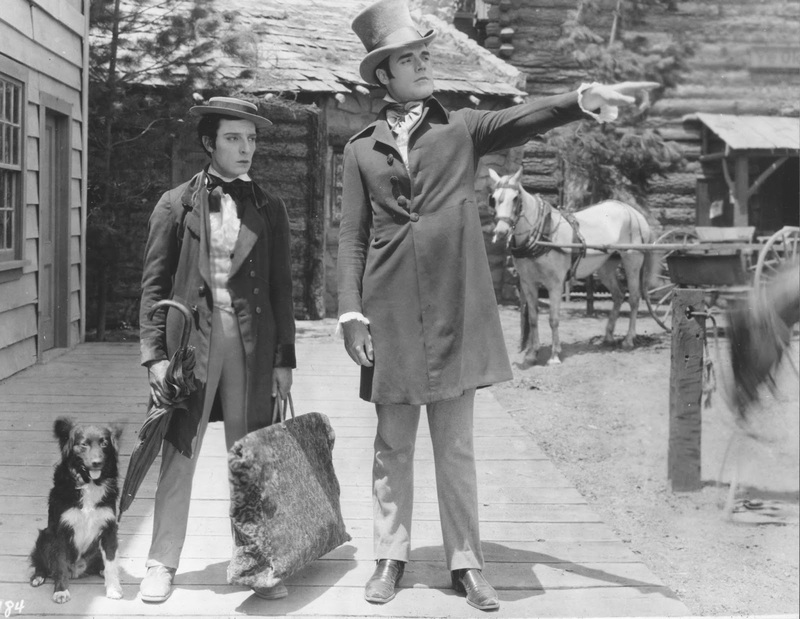 Buster Keaton (left) stars in 'Our Hospitality' (1923), part of the 2015-16 silent film series at the Rogers Center for the Arts. Classic comedies, dramas to be screened with live accompaniment at Merrimack College, North Andover, Mass. NORTH ANDOVER, Mass.—Silent film on the big screen and with live music will return to the Rogers Center for the Arts in North Andover, Mass. with a series of shows scheduled for the 2015-16 season. Admission to the screenings is free and the public is welcome. Musical accompaniment will be performed live by silent film composer Jeff Rapsis, regarded as one of the nation's leading silent film musicians. The series aims to recapture the magic of early Hollywood by presenting silent films as they were intended to be shown: in restored prints, in a theater on a big screen, with live music, and with an audience. "If you can put together those elements, it's surprising how much power these films still have," said Rapsis, who specializes in improvising live music for silent film screenings throughout New England and beyond. "You realize why these films caused people to first fall in love with the movies." • Wednesday, Sept. 23, 2015, 7 p.m.: 'Buster Keaton Double Feature' starring Buster Keaton. Buster breeches the fourth wall big-time in the imaginative "Sherlock Jr." (1924); an old-time backwoods family feud is the focus of "Our Hospitality" (1923), Keaton's breakthrough feature film. Laugh your way through two of the funniest comedies of the silent era! • Wednesday, Oct. 14, 2015, 7 p.m.: 'The Lodger' (1927), directed by (a very young) Alfred Hitchcock. The search is on for the man responsible for a series of murders in fog-shrouded London. Legendary filmmaker Alfred Hitchcock's career began in the silent era, when then young director first produced his brand of darkly suspenseful thrillers. Remember: in silent film, no one can hear you scream! See if if you dare! 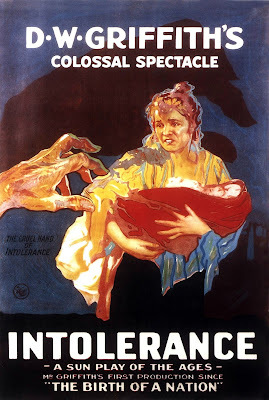 A poster for 'Intolerance' (1916), part of the 2015-16 silent film series at the Rogers Center in North Andover, Mass. The opening program in this season's silent film series at the Rogers Center will include Buster Keaton's 'Sherlock Jr.' (1924) and 'Our Hospitality' (1923), to be screened on Wednesday, Sept. 23 at 7 p.m. at the Rogers Center for the Arts, located on Walsh Way on the campus of Merrimack College, 315 Turnpike St., North Andover, Mass. Admission is free. For more information, call the Rogers box office at (978) 837-5355. Werewolves, time travel, and earthquakes! Greta Garbo and Nils Asther fog up the big screen in 'Wild Orchid' (1929), on the schedule this season at the Manchester (N.H.) City Library. Who says there's no future in silent film? I've just puzzled out titles through the end of 2016 for our monthly screenings at the Manchester (N.H.) City Library. December 2016 sounds like the future to me, so there! The schedule is packed with a wide variety of titles, with one exception: no well-known silent-era classics. 'Wings?' Nope. 'The General?' Sorry. 'Metropolis?' Not here. Don't get me wrong—these pictures are great, and I love doing music for them. But for the Manchester City Library series, the emphasis is on films that rarely get shown, with priority given to those I've never had a chance to see or accompany before. One reason for this is that the Carpenter Auditorium is relatively small—maybe 150 seats. So it lends itself to niche programming. Another reason it that doing unfamiliar films helps me develop my craft. But most importantly, I continue to be amazed at silent-era films that I've never heard of but which hold the screen if given a chance to run as intended: on a screen, with live music, and in front of an audience. Outlets such as TCM are great. But with silent film, there's no substitute for seeing it in a theater with a group of people. It's a completely different experience from seeing it on, say, your home entertainment center with just you and your dog in attendance. With so many vintage titles lost forever through decomposition and neglect, you'd think that the pickings from the silent era would be slim. But instead, the pickings are actually quite fat. Even with about 75 percent of U.S. silent feature-length films gone, several thousand still survive in one form or another. This adds up to a huge world that film buffs can explore for years, discovering surprises all the time. That's what it's been like for me, anyway. And so that's what the library series is all about: celebrating the vast amount of silent cinema that has come down to us intact, and giving it a chance to be seen as intended. So what's coming up? I've updated my "Upcoming Silent Film screenings" page to list everything through December, 2016. But the text of the press release below includes a convenient one-stop schedule for you to ponder. Check it out, and hope to see you at these programs. 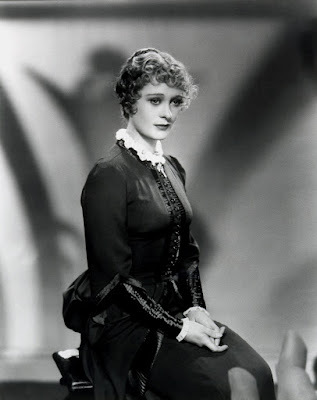 Dolores Costello awaits the big shake-up in 'Old San Francisco' (1927). MANCHESTER, N.H.—Silent film with live music continues at the Manchester City Library with the release of the 2015-16 season schedule. Upcoming programs include stories of time travel, forbidden romance, airborne border patrol agents, and vintage anti-Communist propaganda. A highlight of the schedule is Hollywood's first-ever disaster flick: 'Old San Francisco' (1927) from Warner Bros., a drama about racism climaxed by a recreation of the catastrophic 1906 earthquake that destroyed the city. Another notable title is the first-ever "werewolf" movie: 'Wolf Blood' (1925), an outdoors adventure in which an injured lumber camp boss receives a transfusion of wolf blood and—well, you know. The films are shown on the first Tuesday of the month in the lower level auditorium of Carpenter Memorial Library, 405 Pine St. in downtown Manchester. All screenings begin at 6 p.m. The public is welcome and admission is free, with a donation of $5 per person suggested to help defray expenses. Live music for all screenings is provided by Jeff Rapsis, a New Hampshire-based silent film accompanist. Rapsis, who performs at film festivals and screenings around the country, organizes the Manchester City Library screenings as a way to practice his craft and present seldom-seen silents as they were intended—with live music and with an audience. The series focuses on obscure movies that may have been popular or notable or significant when first released, but which since have faded into obscurity. "Rather than celebrated masterpieces, the films we show in Manchester are more typical of what people would find playing at their neighborhood movie house in the first decades of cinema," Rapsis said. Screening silent films in a theater setting with live music allows their entertainment and cultural value to be enjoyed by modern audiences, Rapsis said. That's true with any vintage motion picture—even those that aren't well-known classics, Rapsis said. "There's a reason people fell hard for the movies right from the start, and putting the silent film experience back together helps us to experience that same excitement even today, no matter what the specific film is," Rapsis said. Because some early feature films run less than an hour, the upcoming schedule includes two programs of double features. Rapsis creates live musical scores for silent films using a digital synthesizer that can reproduce the texture of the full orchestra. The accompaniment is improvised in real time using musical material Rapsis creates beforehand augmented by ideas that occur during the screening. "Creating a score in real time is kind of a high-wire act, but I think it adds an essential element of spontaneity and excitement to any silent film screening," Rapsis said. "You never know exactly how it's going to turn out." • Tuesday, Oct. 6, 2015, 6 p.m.: 'Wolf Blood' (1925). Get ready for Halloween with this early try at turning the werewolf legend into a movie. An injured lumber camp boss receives a transfusion of wolf blood during an operation, and...well, you can take it from there. • Tuesday, Nov. 10, 2015, 2015, 6 p.m: 'My Friend from India' (1927). Dandy Tommy Valentine (Franklin Pangborn) meets and falls for Barbara, the niece of Socialite Bedelia Smith, but fails to learn her name, so he is forced to consult a "Swami mystic." Light-hearted romantic comedy starring a lesser-known star of early cinema who later flourished as a character actor in talkies. • Tuesday, Dec. 1, 2015, 6 p.m.: 'The Road to Yesterday' (1925). Bizarre Cecil B. Demille drama about a married couple who find their strained relationship is the result of unhappiness they experienced in past lives; epic tale encompasses a fiery train wreck, flappers, and time travel. • Tuesday, Feb. 2, 2016, 6 p.m.: 'Wild Orchids' (1929). Steamy tale of forbidden romance: An older man takes his young wife (Greta Garbo) on a business trip to Java. Aboard ship, she witnesses a wealthy passenger brutally thrashing a servant. The violent man is immediately taken by Garbo's beauty and resolves to meet her. • Tuesday, March 1, 2016, 6 p.m.: 'Melodrama Double Feature.' Twin bill of classic low budget melodramas: 'Tentacles of the North' (1926) about two ships trapped in the Arctic ice; and 'The Phantom Flyer' (1928) about an airborne border patrol officer who uses his flying skills to save his sweetheart from a band of cattle rustlers. • Tuesday, April 5, 2016, 6 p.m.: 'Old San Francisco' (1927). Big-budget Warner Bros. historical drama starring Dolores Costello, Warner Oland; story about racial strife in 'Frisco climaxed by a recreation of the city's catastrophic 1906 earthquake. Pioneering film paved the way for all disaster flicks that followed! • Tuesday, May 3, 2016, 6 p.m.: Scandal! Two Early Potboilers. Double bill of early drama: 'The Cheat' (1915), an early Cecil B. Demille story about financial scandal; plus 'Shattered Dreams' (1919), an anti-Bolshevist tale in which a rich businessman attempts to teach his idealist son a lesson by buying him an island off the coast of Florida to establish a Communist paradise. • Tuesday, June 7, 2016, 6 p.m.: 'The Rag Man' (1925). Seldom-screened drama in which young Jackie Coogan plays a child who runs away from an orphanage fire and takes refuge with Max, a junk man played by underrated silent comic actor Max Davidson. The next film in the Manchester City Library's monthly silent film series is 'Wolf Blood' (1925), which will be screened with live music on Tuesday, Oct. 6 at 6 p.m. in the Carpenter Memorial Auditorium, lower level of Manchester City Library, 405 Pine St., Manchester, N.H. The program is free and open to the public. A donation of $5 per person is suggested to help defray expenses. For more information about the Manchester City Library, call (603) 624-6550 or visit http://www.manchester.lib.nh.us. For more information about the music, visit www.jeffrapsis.com. An original promo sheet for 'The Strong Man' (1926). Usually I preview upcoming shows here. But with four films in the past four days, that process kind of got away from me, so nothing got posted. Apologies! So let me say up front: the next silent film program I'm accompanying will be a Harry Langdon's 'The Strong Man' (1926) on Thursday, Sept. 17 at 8 p.m. at the Leavitt Theatre in Ogunquit, Maine. If you'd like more info, the full press release is tacked to the end of this post. But now let me recap the what I've been up to since last Thursday before it gets buried by the days ahead. From 'Hangman's House. 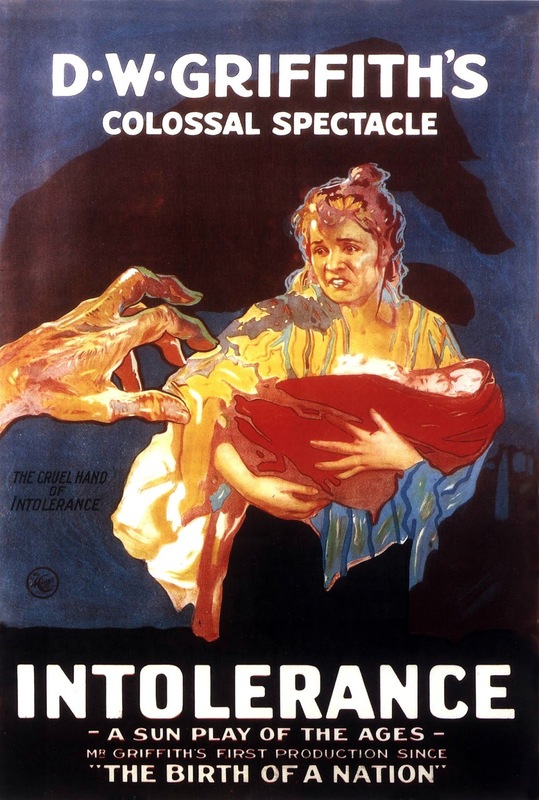 : The Emerald Isle or the Weimar Republic? • Thursday, Sept. 10: 'Hangman's House' (1928) at the Flying Monkey Moviehouse in Plymouth, N.H.: Attendance was down in this entry of our monthly series, probably because it was NFL kick-off night featuring Tom Brady's return to the New England Patriots, which is very big news in this part of the planet. Still, John Ford's last silent film held the screen with its Murnau-inspired visuals, with the action set in a part of Ireland subject to heavy ground fog, apparently. Great to see John Wayne show up as an over-excited villager busting down a fence during a horse race. 'The Cameraman': a film about film itself. • Friday, Sept. 11: 'The Cameraman' (1928) at Red River Theatres in Concord, N.H.: This one fell together quite effectively, I thought. Above average attendance for Red River, and a film that the audience found hilarious right from the beginning, when Buster Keaton finds his face in the lovely Marceline Day's hair. I know 'The Cameraman' pretty well now, and so knew to keep the music as light as possible for as long as possible. Only when Keaton tries photographing the chaotic Tong War can you open up, but then you have to bring it right back down again. Thrilled to hear laughter even during the loudest sections of the war. Success! 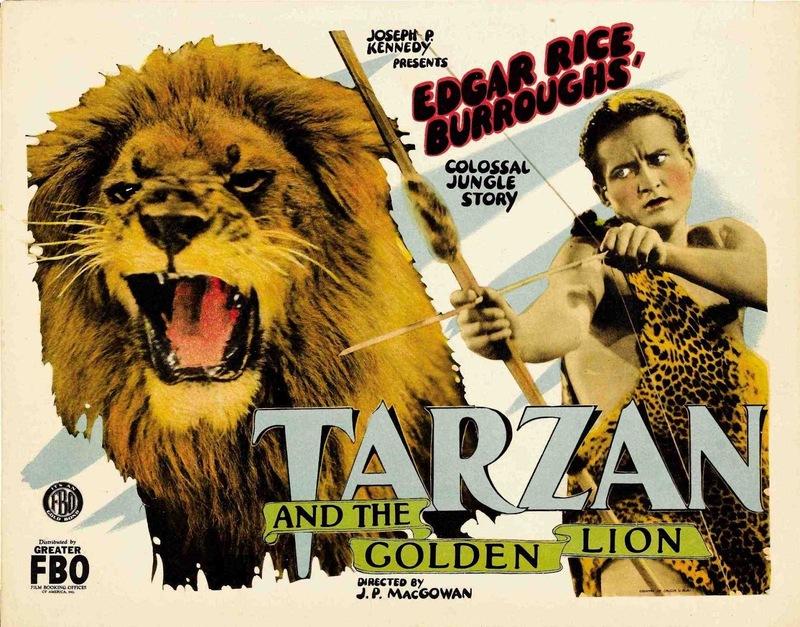 The silent Tarzan: supply your own jungle yell if you like. • Saturday, Sept. 12: 'Tarzan and the Golden Lion' (1927) at the Brandon Town Hall and Community Center in Brandon, Vt.: A wealth of pre-show publicity in the local media coupled with a rainy evening led to a record-busting attendance of about 125 people. Nice! James Bridges as Tarzan got a good reaction, but people seemed more excited by our warm-up feature, 'The Sign of the Claw' (1926), the only surviving feature of second-tier German shepherd star Peter the Great. Hooting and hollering on this one started early, when Peter pulled a hapless toddler from the path of a heavy truck. From 'The Leaping Fish': the label says it all. • Sunday, Sept. 13: 'The Matrimaniac' (1916) and other films starring Douglas Fairbanks, Sr. at the Somerville Theatre in Somerville, Mass. : More rain helped boost attendance at this program of rarely screened early Fairbanks pictures, which also included 'The Missing Millionaire' (1917) and 'The Mystery of the Leaping Fish' (1916). For 'Matrimaniac,' the only full-length feature, reaction was muted, I thought—possibly the effect of having to run the 35mm print at 24 fps, clearly too fast. Looking forward to the Somerville getting the ability to run variable speed when needed on its 35mm Norelcos. 'Millionaire,' a later film that used the same footage from 'Matrimaniac' to tell a completely different story to capitalize on Fairbanks' popularity, was a real treat. 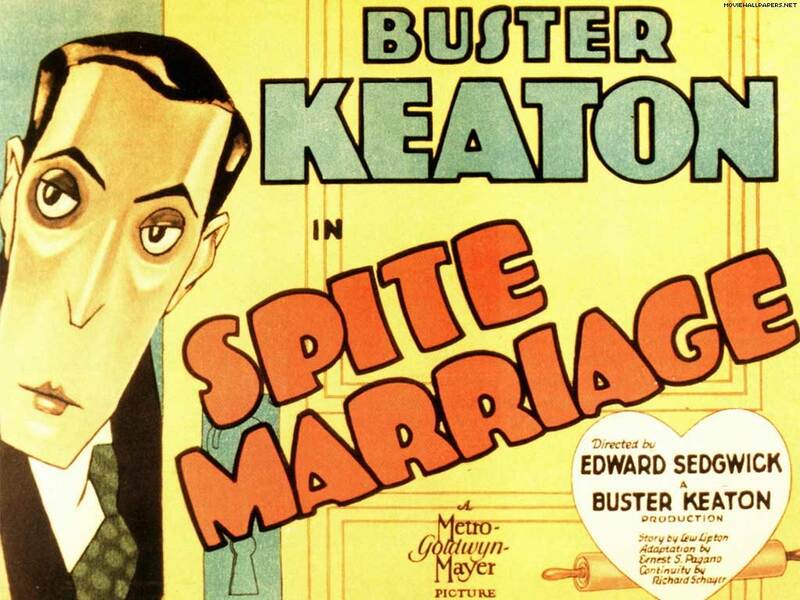 Seeing the two movies one after another reminded me of a Michael Frayn farce—or a bit like Keaton's 'Spite Marriage' (1929), where we see scene played completely straight, then see it again as Buster ruins it in increasingly creative ways. And what can you say about 'Leaping Fish' and its gleeful depiction of drug use? Throughout the film, my accompaniment was augmented by the sound of jaws hitting the floor. So it was a good four-day run with a variety of films in some vastly different settings. But I like doing these mini-marathons because by the end, I feel like I have a fluency at the keyboard that allows me to go places I usually can't. Somehow, the momentum carries me. Either that, or I'm so disoriented I just don't know what the hell I'm doing anymore. Could be a combination of both! Okay, here's the press release for the Langdon program later this week. Hope you can make it! Harry Langdon in 'The Strong Man' (1926). OGUNQUIT, Maine — Silent film with live music returns to the big screen at the Leavitt Theatre in September with a showing of an uproarious comedy starring Harry Langdon. The screening, on Thursday, Sept. 17 at 8 p.m., will feature Langdon's classic picture 'The Strong Man' (1926). Harry Langdon experiences temptation in 'The Strong Man' (1926). "So the Leavitt's silent film screenings are a great chance for people to experience films that first caused people to first fall in love with the movies," he said. 'The Strong Man' (1926) will be screened with live music on Thursday, Sept. 17 at 8 p.m. at the Leavitt Theater, 259 Main St., Route 1, Ogunquit, Maine. Admission $10. For more information, call (207) 646-3123 or visit www.leavittheatre.com. Frank Capra's 'The Strong Man' will be screened with live music by Jeff Rapsis on Thursday, Sept. 17 at 8 p.m. at the Leavitt Theater, 259 Main St., Route 1, Ogunquit, Maine. Admission $10. For more information, call (207) 646-3123 or visit www.leavittheatre.com. at Flying Monkey theater in Plymouth, N.H. Okay, here's one I've been looking forward to. Tonight (Thursday, Sept. 10) our monthly silent film series in Plymouth, N.H. takes a turn for the dramatic with 'Hangman's House' (1928). It's the final silent film from young director named John Ford, who would go on to win four Academy Awards for his later work. 'Hangman's House' isn't regarded a masterpiece. But that's what I find exciting about it. Unencumbered by legend or expectations, it's a picture that simply shows silent film at the top of its expressive power. To me, it's a prime example of how filmmakers had learned how to naturally use the motion picture medium to tell a story visually, and for maximum effect. And it helped that German director F.W. Murnau had come to Hollywood to make 'Sunrise' at Fox studios at the same time Ford was working there. 'Sunrise,' widely regarded as one of the most beautiful pictures of any era, set new standards for what a silent film could look like. 'Hangman's House,' set in Ireland, shows Murnau's influence in the scenes played out amid the ground-hugging fog and shadows. There's also a terrific visual fluidity to 'Hangman's House.' Although the story proceeds naturally, Ford is able to weave in vivid fantasy images that show the inner feelings of characters and underscore the drama. 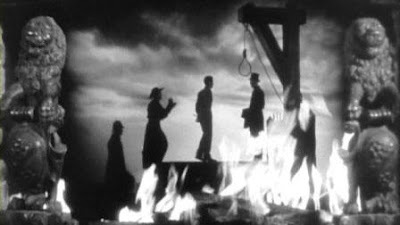 'Hangman's House' is one of those late silents that came and went quickly, released when talking pictures were already the rage. At the time, I think few people appreciated how absorbing even a non-masterpiece silent could be. So it's a special pleasure to present a film such as 'Hangman's House' to audiences today. 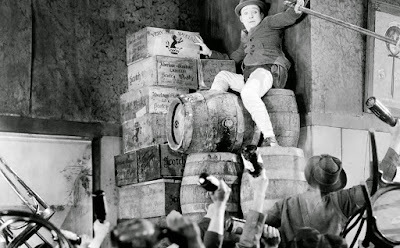 Uncorked after all these years, it's a time-capsule of drama that plays just as strongly as when it was new—perhaps even more so, because silent film is such an unusual experience for modern audiences. People are often surprised to find a well-made movie with all the techniques of silent film story-telling at its disposal, and a director who knew how to use them. And I'm so pleased to do accompaniment that I hope helps facilitate this discovery. The music will definitely be of the "less is more" school, with just a hint of Irish coloring. Another attraction of 'Hangman's House' is that it includes one of the earliest on-camera appearances by a clearly identifiable John Wayne. Wayne shows up in a crowd of lively villagers watching a horse race. The Duke's response is so exuberant that he destroys the fence holding back the crowd! It's a perfect cameo for Wayne, who indeed would not be held back. He'd later work with Ford on 14 major motion pictures, including classics such as 'Stagecoach' (1939) and 'The Searchers' (1956). One major Ford/Wayne collaboration would be 'The Quiet Man' (1952), taking the pair back full circle to a story set in Ireland. So join us tonight for a rarely screened movie that you may never have heard of—but which you surely won't forget. Showtime is 6:30 p.m., so you'll be out in time for the Patriots kick-off. More info is in the press release below. Hope to see you there! 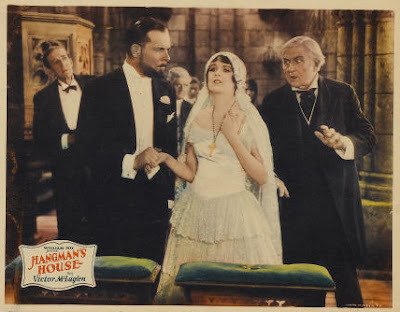 PLYMOUTH, N.H.—The silent film era returns to the big screen at the Flying Monkey Moviehouse and Performance Center with a showing of 'Hangman's House' (1928), a classic silent drama accompanied by live music. Showtime is Thursday, Sept. 10, at 6:30 p.m. at the Flying Monkey, 39 Main St., Plymouth. All are welcome to this family-friendly event; admission is $10 per person general admission. 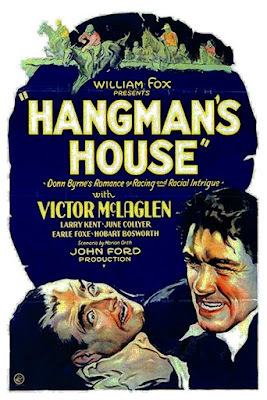 Set in Ireland, 'Hangman's House' follows wanted man Denis Hogan (Victor McLaglen) who returns in disguise to his Irish homeland to seek revenge. Once back, he becomes embroiled in an intense romantic drama involving a local judge (Hobart Bosworth), his daughter (June Collyer), a forced marriage and surprising revelations about his own sister. The film is highlighted by a high-stakes horse race. 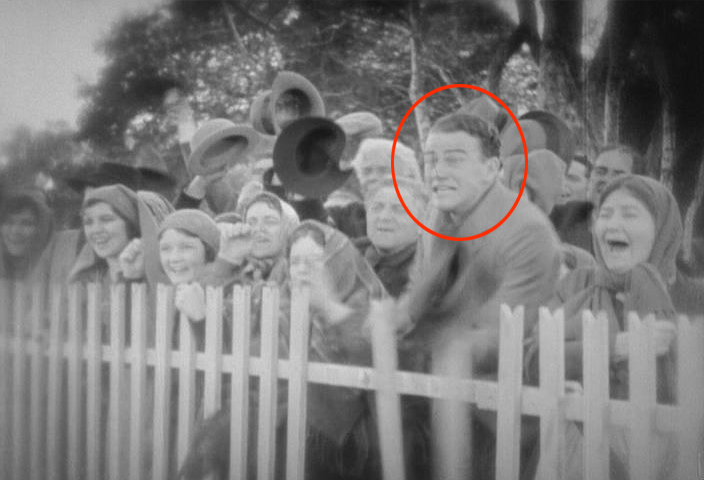 Among the spectactors is a very young John Wayne, clearly visible as an extra who gets so excited he single-handedly destroys a fence. The story culminates in a spectacular fire sequence that mesmerized the film's original audiences and still maintains its power today. 'Hangman's House' is praised for taut story-telling and evocative camerawork. Ford returned to Ireland as a setting in his later film 'The Quiet Man' (1952), this time starring John Wayne. The screening of 'Hangman's House' is the latest in the Flying Monkey's monthly series of great silent films shown on the big screen with live music. Accompanist Jeff Rapsis will improvise an original musical score for 'Hangman's House' live as the film is shown. 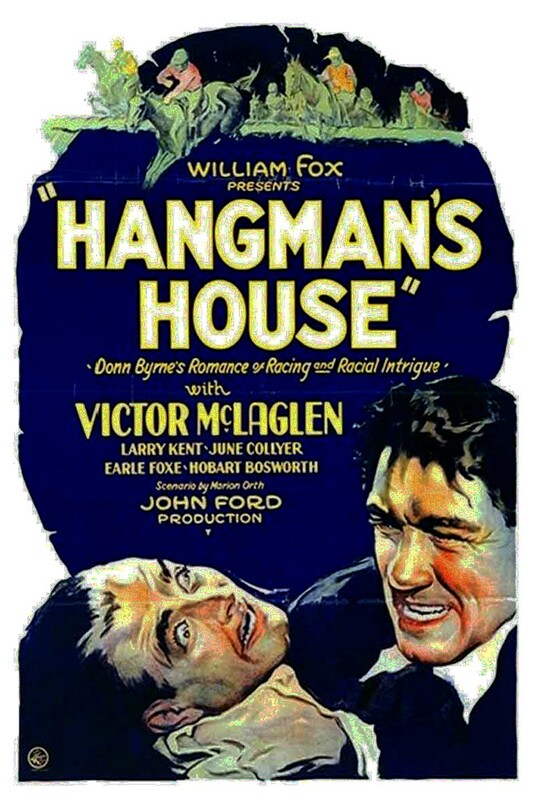 ‘Hangman's House’ (1928), a classic silent drama directed by John Ford, will be shown with live music on Thursday, Sept. 10 at 6:30 p.m. at the Flying Monkey Moviehouse and Performance Center, 39 Main St., Plymouth. Admission $10 per person. For more info, call (603) 536-2551 or visit www.flyingmonkeynh.com. For more on the music, visit www.jeffrapsis.com. 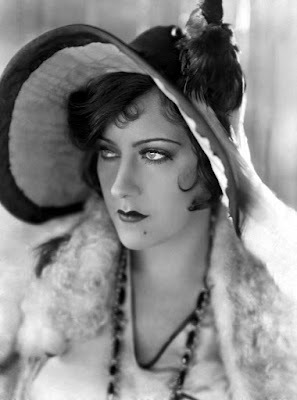 Gloria Swanson stars in 'Sadie Thompson' (1928), screening tonight (Tuesday, Sept. 8) at the Manchester (N.H.) City Library. The silent film calendar was rather light as August turned into September. And I'm not complaining. But that's over now. The next six days bring five very different programs to accompany: drama, comedy, jungle action, and more. And this week's mini-marathon is capped by an unusual Douglas Fairbanks double feature in which footage from one of his early comedies was reedited into a new film that tells an entirely different story! I'll post info here about the screenings as they come up. Or check out the "Upcoming Silent Film Screenings" link at upper right. Beyond this, I'm looking forward to a busy performance calendar this fall, with a packed schedule of Halloween shows followed in November by an appearance at the Niles Essanay Silent Film Museum in California. In December, I head to Cincinnati for a program on Thursday, Dec. 10 at the Carnegie Visual and Performing Arts Center, where I last performed in 2013. And on the way back, I'll make my international debut on Sunday, Dec. 13 at the Revue Cinema in Toronto, Canada. To prepare for these high-profile gigs, I'm working on pushing my keyboard technique up a notch. So I've recommitted to playing the Hanon technical exercises on a regular basis, plus a few of my own invention. The goal remains to develop more fluency getting around the keyboard, and imagining and making music without necessarily looking down at the keys, which helps in accompaniment. Also on the improvement program is good old Beethoven. Recently, I realized a long-standing ambition when I got hold of the Liszt piano transcriptions of Beethoven's nine symphonies. So I'm slowing playing through them in order, and it's been a real rush to experience this familiar music and bring it to life in this way. Basically, each day I work through a movement at a very slow speed (sight-reading has never been my strength) and note any harmonies or progressions that are surprising or instructive. 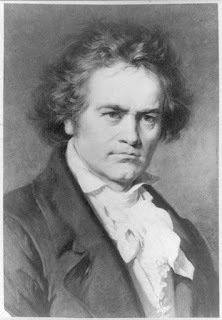 That way I push my keyboard technique, but also absorb some of Beethoven's moves for later use. We'll see if any of this makes a difference with tonight's screening of 'Sadie Thompson' (1928) at the Manchester (N.H.) City Library. It's Gloria Swanson and Lionel Barrymore doing battle in the steamy tropics, so it helps that we're in the middle of a September heat wave in our part of the world. 'Sadie Thompson' is missing its final reel, but I think that actually adds to the experience. To me, it seems as if the conflict between Swanson and Barrymore gets so intense that film just can't contain it any longer. Instead, we're left with a reconstruction of stills and descriptions that leave the climax up to our own imaginations, making it potentially more personal and powerful than anything a filmmaker could put on the screen. So it's an unusual form of narrative: a traditional film until the final reel, and then the audience is required to imagine the action based on a general outline. There's a certain primal power in this approach. I recall Hitchcock saying that it was more terrifying to let something nasty happen offscreen, because people's imaginations would always make it worse than any filmmaker could show. There's something about that in the way 'Sadie Thompson' must now be shown, with its last reel missing. 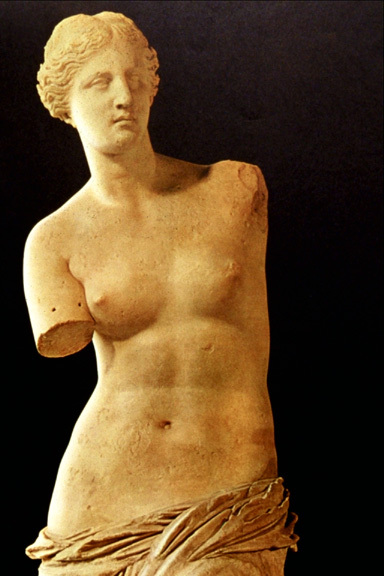 So 'Sadie Thompson' is in the same category as, say, the Venus de Milo, or Schubert's 'Unfinished Symphony.' They're great works of art that achieve perhaps a higher form greatness by virtue of their being incomplete.